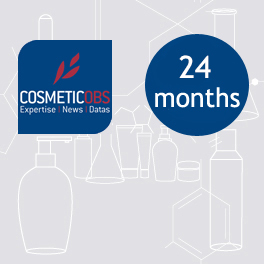 Unlimited individual access for 12 months to all CosmeticOBS PRO content (articles, product sheets, ingredient sheets). Unlimited access to all PRO content (articles, product factsheets, ingredient factsheets) for 24 months. Unlimited individual access for 6 months to all CosmeticOBS PRO content (articles, product sheets, ingredient sheets). Unlimited individual access for 3 months to all CosmeticOBS PRO content (articles, product sheets, ingredient sheets). Unlimited individual access for 1 month to all CosmeticOBS PRO content (articles, product sheets, ingredient sheets).